Leah Modigliani’s art and critical writing is framed by her interest in the history of conceptual art, the dynamics of the art market, the history of the avant-garde, and the relationship of all these to historical and contemporary critiques of capitalism. Over the last year she has been producing a series of sculptures inspired by three-dimensional objects found in press photographs of public protests taken in Europe and North America over the course of the twentieth-century. Objects like costumes, props, or barricades made by people who did not necessarily consider themselves artists once worked to visually designate a space of free speech. These lost spatial markers find new life in Modigliani’s art, recreated as freestanding sculptures that have been made and built from contemporary materials to varying scales. 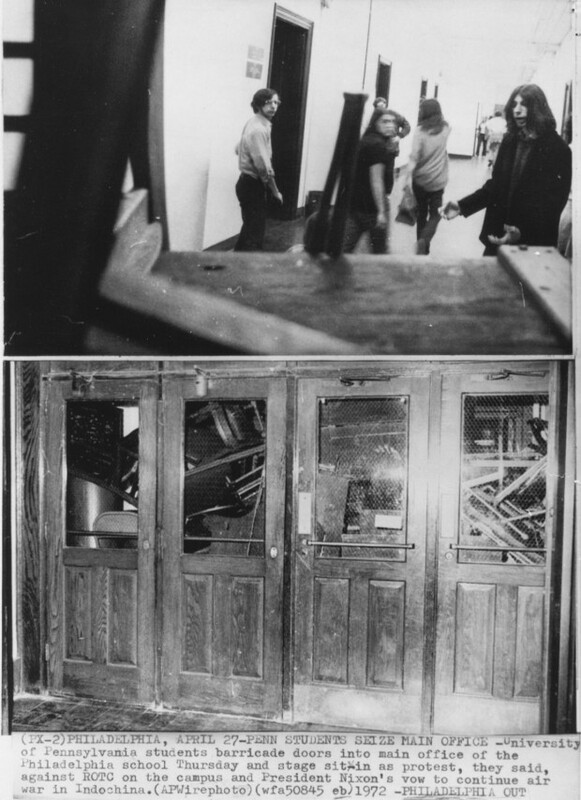 The installation at Vox Populi rebuilds and reimagines one of the entrance barricades erected by students, who, angered by army recruitment on campus during the Vietnam War, occupied College Hall overnight at the University of Pennsylvania on April 27, 1972. Such a material visualization of the space of past protest movements in the present is always threatened to become fetishized as a consumable commodity, posing questions about the value and political efficacy of artistic and intellectual labor in the twenty-first century. This project was only made possible with the help of Jim Christensen, whose design and fabrication assistance were crucial for its realization, and through funding generously provided through a Vice Provost for the Arts Grant from Temple University. Leah Modigliani is an artist and writer living in Philadelphia. She earned a BFA degree from Concordia University, a MFA from the San Francisco Art Institute, and a PhD in Art History and Criticism at Stony Brook University. She is Assistant Professor of Visual Studies at Tyler School of Art. Modigliani’s visual work has been exhibited at Yerba Buena Center for the Arts in San Francisco, the Art Gallery of Nova Scotia in Halifax, the Museum of Contemporary Canadian Art in Toronto, and the Moore Space in Miami, among other galleries and museums. Her critical writing can be found in academic journals and contemporary art magazines such as Prefix Photo, Art Criticism and C Magazine. Kelsey Halliday Johnson | A spy in the house of life.